Elevated between 3061 ft and 4390 ft, the Ski Resort is among the 10 highest elevated Ski Resorts in Upper Austria. The vertical drop from summit to base is 1329 ft. The average difference in altitude between base and summit of Ski Resorts in Austria is 2392 ft. Runs and slopes are therefore relatively short. Hochficht is the the best rated ski resort in Upper Austria. It is known to be the most family-friendly ski resort in Upper Austria. Season starts on Dec 15 and ends on Mar 24 (99 days). Average season duration in Austria is 114 days. Average snow depth during the season (Dec 15 to Mar 24) is 43 " at summit elevation and 35 " at base elevation. Snow coverage is usually best during February, offering an average snow depth of 49 " at summit elevation and 40 " at the base. Therefore Hochficht is among the 5 ski Resorts with best snow conditions in Upper Austria. Hochficht features 36 sunny days on average per season. The average for all ski Resorts in Austria is 43 sunny days. February is the sunniest month with an average of 20 sunny days. 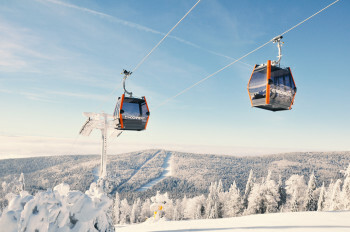 This makes the ski resort one of the 5 sunniest in Upper Austria. 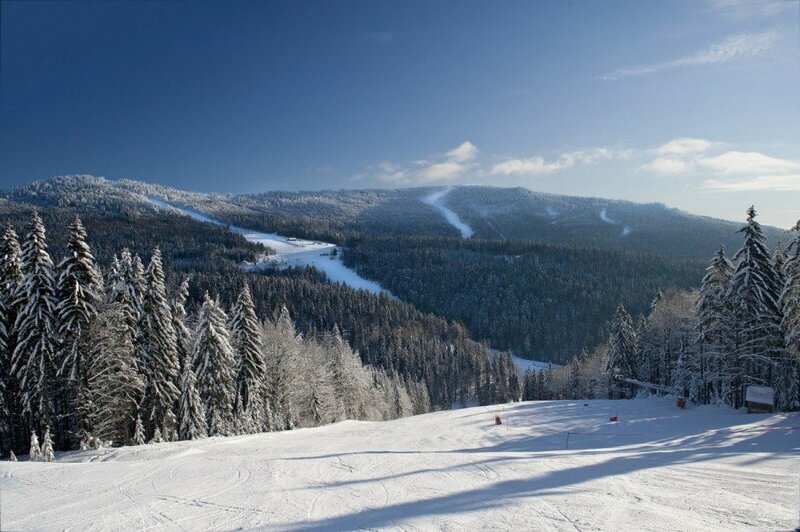 Offering 12 miles of slopes and terrain, Hochficht is among the 3 largest Ski Resorts in Upper Austria. 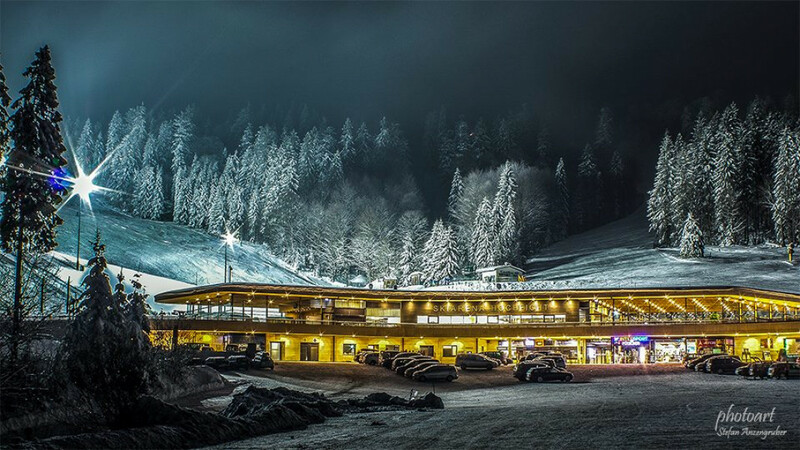 New Skiarena Hochficht: A cashier desk, ski school, Intersport shop and restaurant all under one roof! The family ski area Hochficht is located in the beautiful Bohemian Forest in Upper Austria. It is only 60 kilometres from Passau in Bavaria and 75 kilometres from Linz in Austria. As the ski area is easy to reach without taking any toll roads, it is a popular destination for a day trip to the mountains. Hochficht offers 20 kilometres of runs, most of which are marked blue or red. 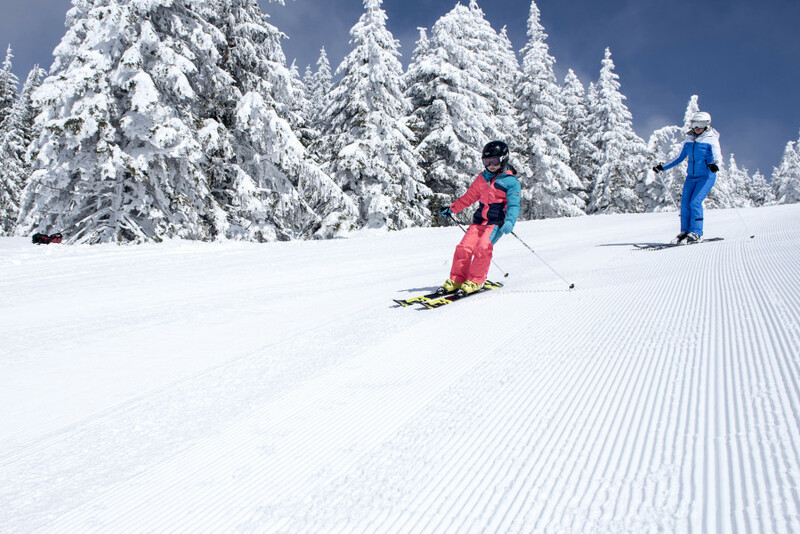 The resort is therefore a great place for beginners to hone their skills thanks to the gentle gradients of most slopes. Although the Rehberg run no. 6 is specially designed for inexperienced skiers, the other blue-marked trails are also relatively straightforward for beginners who are not skiing for the first time – the Stierwiese (no. 2) and Hochwaldabfahrt (no. 4) runs stand out in this respect. Kids have to look no further than Fichtl Kids Park. The park is a stone’s throw from the car park and offers a ski carousel and a magic carpet lift to keep the little ones happy! 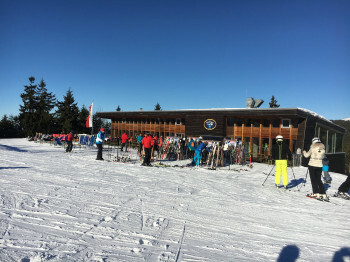 The Kinderskiroute through the forest from the Hochwaldabfahrt to the Rehbergabfahrt is particularly popular with youngsters looking for adventure. Whether on their own or accompanied by an adult – there are certainly a few surprises in store along this trail. Hochficht is also a great day out for advanced skiers. There are 10 kilometres of red-marked trails to enjoy and beautiful views over the Bavarian and Bohemian Forest come as standard. We highly recommend the Zwieselbergabfahrten (no. 7, 7a) and Standard-Abfahrt (no. 1), which are certified FIS runs, if you are looking for more of a challenge. There is even a boardercross course on the Standard trail for anyone looking for some white-knuckle action, as well as a terrain park to keep freestyle fans happy. 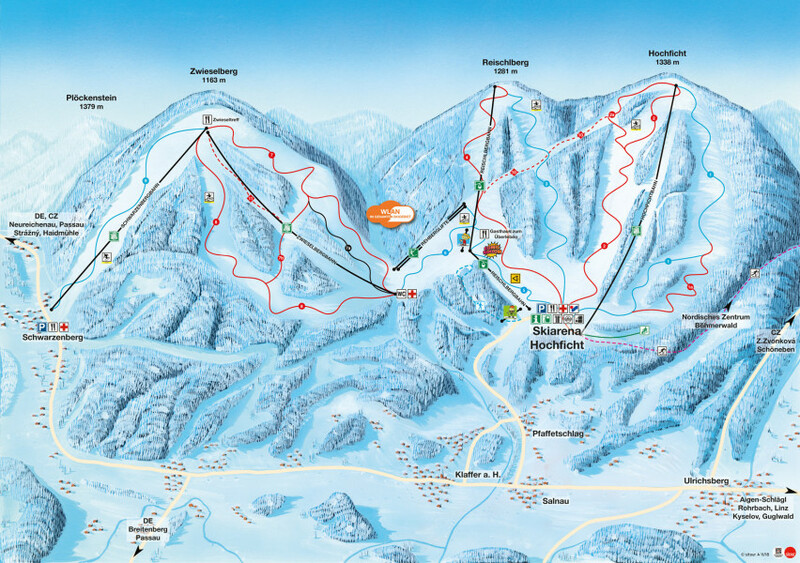 There are also two off-piste ski routes on Hochficht mountain – the Krumauer-Skiroute and Zwieselberg-Skiroute. 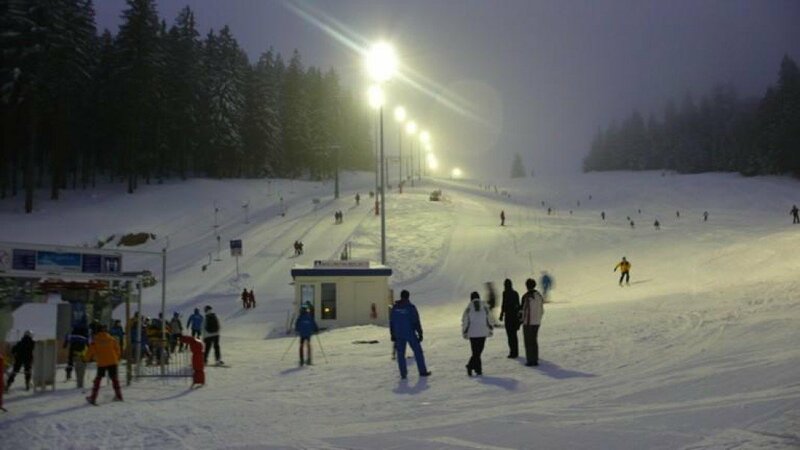 Every Wednesday and Friday evening, the Wenzelwiesenabfahrt plays host to floodlit skiing between 5 PM and 8:30 PM. If you spend all day on the slopes, you will no doubt work up a healthy appetite sooner or later. Luckily, Hochficht offers everything from hearty mountain fare to afternoon tea. The newest restaurant at the resort is located in the newly built Skiarena and it offers delicious food in modern surroundings. In contrast, the Gasthaus zum Überleben has more of a rustic charm, serving authentic Austrian delights as well as coffee and cake. The highest restaurant in the ski area is the Zwieseltreff on Zwieselsberg mountain, some 1150 metres above sea level. Advanced skiers visiting Hochficht should make a point of trying the FIS runs. These include the Standard-Abfahrt (no. 1) down to the valley station of the Hochfichtbahn and the Zwieselsbergabfahrt (no. 7, 7a), which is also the steepest run in the entire ski area. If you fancy a change of pace, the sled run is great fun for all the family. The Bohemian Forest provides the perfect landscape for enjoying walks through the snowy backcountry, too. Moreover, the region is known for its extensive network of cross-country skiing routes and is a real mecca for fans of this type of skiing. And if you fancy a few drinks to round out the day, the valley station of the Schwarzbergbahn is undoubtedly the place to be, as the party continues long after the mountain closes at the “Einkehr Schwarzenberg”. If you’d prefer a spot of après-ski action on the mountain, then hit the umbrella bar at the Gasthaus zum Überleben. The ski area is very well signposted from the surrounding towns and is therefore easy to find. From Germany, Hochficht is best reached via Passau. From there, you can either head towards Waldkirchen (B12) or Hauzenberg (B 388) then on to Schwarzenberg or Klaffer – the ski area is within easy reach of both of these towns. From the Linz direction, you can head to Hochficht on the Rohrbacher Bundesstraße (B 127) and then via Rohrbach, Aigen and Ulrichsberg.